LOOP-LOC invites dealers to send them their highest quality photos of LOOP-LOC’s revolutionary products successfully in use in their customers’ backyards. Winners will be featured prominently on LOOP-LOC’s Facebook page to highlight and promote their excellent work. Safety pool company that services New Jersey, LOOP-LOC, discusses their #SwimmingPoolSpotlight campaign. Mesh covers. Mesh covers are made with a super-dense weave that blocks virtually all sunlight but still lets rain and melting snow easily drain through. Aqua-Xtreme, their virtually solid mesh cover, blocks light and drains quickly—50 percent faster than typical covers. It also deters algae growth. Solid covers. Solid safety covers combine the light weight of a mesh pool cover and the light-blocking benefits of a solid cover. Virtually solid mesh covers. 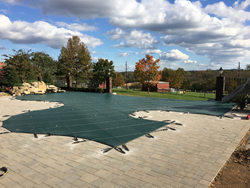 An industry first, the Aqua-Xtreme virtually solid mesh pool cover uses a light blocking fabric that deters algae growth and drains lightning-quick. Unlike other light blocking covers, this one drains up to 80 gallons per minute without clogging. It is also 50 percent lighter than solid safety covers for easy handling. Luxury liners. More than 30 elegant designer patterns are manufactured using only the highest quality virgin vinyl material in durable 20 & 28 mil. The colors are gorgeous! Revolutionary treatments. The CABLE-LOC™ Raised Wall Treatment offers a much faster installation and higher quality compared to other treatments. PROTECT-A-GAP® is the safest and simplest way to close gaps created by raised spas, waterfalls, rises, or any obstructions higher than nine inches. The AQUA-LOC® Zipper Treatment safely meets the challenges presented by large commercial pools with nonremovable raised obstructions and rails. Every week, LOOP-LOC invites dealers to send them their highest quality photos of LOOP-LOC’s revolutionary products successfully in use in their customers’ backyards. The #SwimmingPoolSpotlight winners will be featured prominently on LOOP-LOC’s Facebook page, and provide the winner the opportunity to highlight and promote their excellent work—incorporating LOOP-LOC products in a gorgeous pool and surrounding area—to their demographic.